Hello hello! Sorry I've been so quiet this week, I've been a bit swamped in other parts of my life so this post is getting up later than I had expected. Boo! So what I have for you today is a fun recreation of a look that I did waaaaay back in 2013. I think it was one of my first looks that used striping tape and I remember being super thrilled with how it turned out. :) I have a comparison of then and now below the cut, and you can also check out the full original post here! This looks is also my last January fill for The 30 Days of Colour where our theme was 'Recreation'! Here's a comparison of the old and new versions... 2013 on the left, current on the right! I tried to do as close of a recreation to the original look as I could, which meant trying to make the same lines and using the same polishes. :) My base this time was Sinful Colors Snow Me White (whereas last time I used an Essie shade) but the colours are the same: Julep Jasmine and Julep Echo with a black striper for the details. You can definitely see that my pictures are a bit cleaner now and I think the lighting is better, too. But overall 2013!Katherine didn't do a bad job! Good job, self! Yep, tacky 80's-esque fabulousness. :) Just what the day needed! I don't use striping tape nearly enough and I have a crap ton of it. Thanks for the inspiration. It looks great! 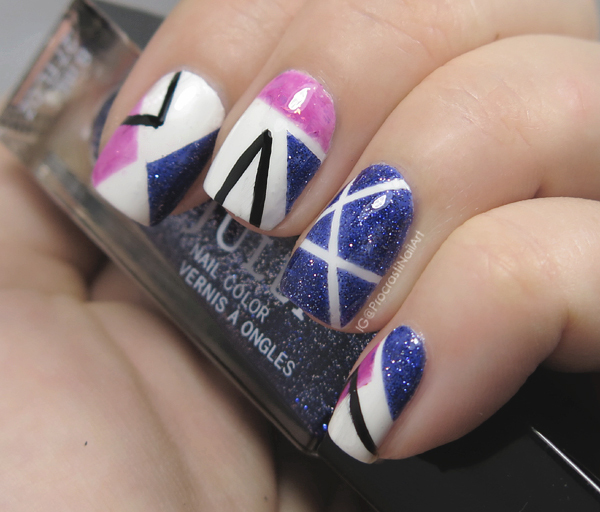 I have to go back and start using my striping tape now. Love this! Striping tape techniques were one of the first nail art things I tried, and I remember it not going so well, ha ha, but maybe I will have to break it back out again now that I have more experience. 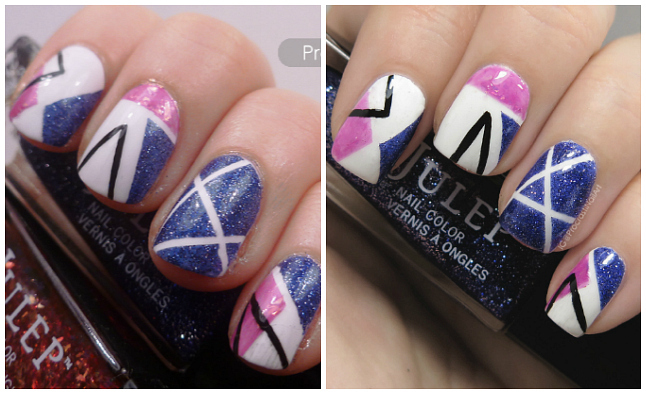 Okay, I don't know what you're on about... because both of these nail looks look awesome to me. I love these crisp, geometric lines! Really fun art! I can see more crispness in your art and pictures in the new version. These are really fun looking! 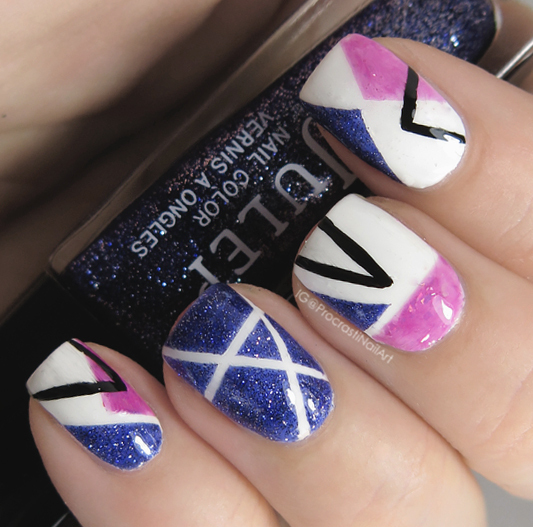 Good for you for using striping tape too! I don't have the patience for it anymore haha. This is very '80s modern! You did a great job recreating this. I adore it. Sometimes you just need a little 80's fun in your life! I love seeing recreations! You did a good job!